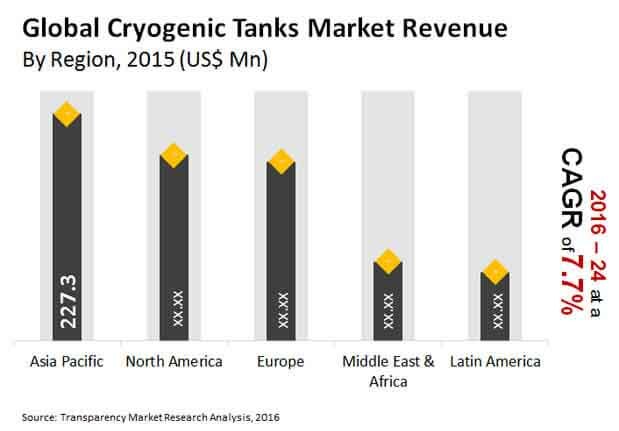 The global cryogenic tanks market is highly fragmented in nature on account of the presence of a copious number of original equipment manufacturers and raw material suppliers. However, the market is substantially consolidated in regional pockets as most of the prominent players operate at regional levels. A report by Transparency Market Research finds that the market is stagnated at the moment and challenged on the growth front on account of a massive backlog of orders. Steep manufacturing costs, sensitive raw material costs, and high cost of skilled labor are also posing a roadblock to the growth in the market. Savvy manufacturers competing for greater share in the global cryogenic tanks market are making continued efforts to overcome these challenges and tap into the growth opportunities that the market offers. Cryofab Inc., Cryoquip Australia, Cryogas Equipment Private Ltd., VRV S.p.A, Eden Cryogenics LLC, and FNF Gas Technology Products Private Ltd. are to name a few of the prominent players in the industry. TMR predicts the global market for cryogenic tanks to rise at a steady CAGR of 7.7% during 2016 and 2024. Expanding at this pace, the market is slated to reach a value of US$1.433 bn in 2024 from US$0.740 bn in 2015. Depending upon application, the global market for cryogenic tanks can be divided into storage and transportation. Among them, the storage application leads the market on account of massive on-site production of industrial gases and LNG which are stored in cryogenic tanks. In 2015, the segment accounted for a lion’s share of the overall market – around 80%. The transportation segment witnessed an increased demand for liquefied industrial gas and LNG cryogenic tanks in the past few years owing to the increase in production volumes across different oil and gas producing countries and the swift pace of industrialization across emerging economies. Geographically, the global cryogenic market can be segmented into Asia Pacific, North America, Europe, the Middle East and Africa, and Latin America. Among them, Asia Pacific leads the market vis-à-vis sales volume and revenue. In 2015, the region contributed to over 30% of the total number of cryogenic tanks sold worldwide. Asia Pacific is predicted to hold on to its dominant position in the years ahead as well on account of no letup in the ongoing pace of industrialization and setting up of manufacturing capacities. A substantial increase in the consumption of LNG has also bolstered uptake of LNG cryogenic tanks in Asia Pacific in the recent past. “Driving growth in the global cryogenic tanks market is their design that makes them the most efficient and safest means of transportation and storage of liquefied form of several industrial gases such as nitrogen, liquefied natural gas (LNG), oxygen, and argon. Inland and offshore transportation and on-site and off-site storage of these gases constitute a big chunk of the overall revenue of the global cryogenic tanks market,” says the lead analyst of the TMR report. The market will also be boosted by the increase in the array of industrial gas applications. One factor countering the global market for cryogenic tanks is their steep manufacturing costs on account of cutting-edge technology involved and the need for particular components and technical expertise. “Stringent quality- and safety-related guidelines that need to be followed to manufacture and sell cryogenic tanks significantly add to the base cost of cryogenic tanks, restricting their adoption across numerous industries and applications,” adds the analyst of the report.